A significant number of students in any class have the wrong notion that circular motion and rotation (or, generally angular motion) is a somewhat difficult section. But you can rest assured that this section is as interesting and simple as any other section of your choice, provided you have a clear understanding of the basic principles. You will find the useful formulae and many questions in this section, posted earlier on this site, which can be accessed by clicking on the label, ‘circular motion and rotation’ below this post. Since the number of posts displayed in each screen is limited, you will have to make use of the ‘older posts’ tabs to access all the posts. The angular impulse received by the rod is equal to the change in the angular momentum of the rod. Since the rod is initially at rest, the change in the angular momentum of the rod is equal to the angular momentum supplied by the two objects. Because of the collision, the rod will rotate about a normal axis through its middle and the total angular momentum of the objects about this axis of rotation is mvL/2 + mvL/2, which is equal to mvL. Thus the angular impulse received by the rod is mvL. Iω = mvL where ‘I’ is the moment of inertia of the rod and the masses m and m at its ends. [Note that we have equated the final angular momentum of the system (containing the rod and the masses) to the initial angular momentum]. [The first term within the square bracket above is the moment of inertia of the rod about a central axis perpendicular to its length and the second term is the moment of inertia of the two masses]. Since m = M/6 the above equation becomes. Therefore ω = 1 radian/sec. Therefore, the time taken by the rod to rotate through π radian is π sec. (a) along the direction of motion of the electron. (b) opposite to the direction of motion of the electron. (e) normal to the plane of the orbit. The correct option is (e). The angular momentum vector is the vector product (cross product) of the radius vector r and the linear momentum vector p (of the electron). The angular momentum vector r×p is perpendicular to both r and p. Therefore, the angular momentum of the electron due to its orbital motion must be directed normal to the plane of the orbit. (4) A solid cylinder of mass M and radius R is mounted on frictionless bearings so that it can rotate about its horizontal axis (Fig.). 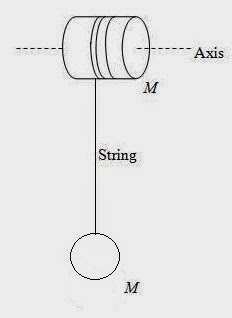 A light inextensible string, one end of which is fixed to the cylinder, is wound round the cylinder and carries a sphere of mass M. Initially the system is at rest. On releasing the sphere, it moves down under gravity and the cylinder starts rotating. What is the speed of the sphere after it has descended through a distance h? Mgh = ½ Mv2 + ½ Iω2 where v is the speed of the sphere on falling through the distance h, I is the moment of inertia of the cylinder about its axis and ω is the angular velocity of the cylinder. [Note that the sphere has translational kinetic energy and the cylinder has rotational kinetic energy]. Now, click here to see more questions in this section.